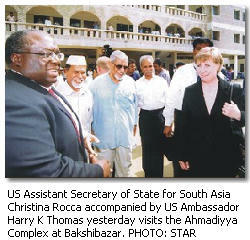 US Assistant Secretary of State for South Asia Christina Rocca yesterday said she conveyed the US concern to the government that Bangladeshs tradition as a moderate Muslim society is going off track because of the ban on the Ahmadiyya publications and attacks on their mosques. Bangladesh has a long tradition as a moderate and tolerant society, Rocca said. The problems that the Ahmadiyyas are facing cause us concern, because it looks as if things might be getting off track a little, Rocca told journalists at a press conference at the American Centre when asked about her impression of the treatment of the Ahmadiyya sect. The visiting US assistant secretary also revealed that Dhaka has expressed interest in receiving US assistance in the ongoing investigation into the Chittagong arms haul. Foreign Secretary Shamsher Mobin Chowdhury told journalists on Tuesday that Bangladesh would ask US for investigation assistance only if it was needed. She told reporters that she expressed her concern to the government about the source and destination of the arms and that the US would continue to help probe the matter. The development coincides with the agreement Bangladesh signed early yesterday on allowing the US to set up border controls when Rocca visited State Minister for Home Affairs Lutfozzaman Babar. Rocca made the comments while wrapping up issues she discussed with government officials, opposition leaders and civil society groups on the second day of her three-day visit. Earlier yesterday, Rocca visited the Ahmadiyya Complex in Bakshibazar and spoke with leaders of the community to know of their condition in the wake of the government on their publications and attacks on their mosques by Sunni hardliners in January. She also called on Industries Minister and ruling coalition partner Jamaat-e-Islami Amir Motiur Rahman Nizami to convey her concerns about the Ahmadiyya issue and Bangla Bhai, who runs a vigilante outfit against outlaws in the northwest reportedly under government patronage. Nizami told The Daily Star that he defended the government ban of Ahmadiyya publications because the claim by Ahmadiyyas as Muslims is not acceptable to Muslims, as Ahmadiyyas distort Islam. He added that he assured the US official that there is no religion-based confrontation in Bangladesh. On the state of law and order and human rights in Bangladesh, she said Dhaka and Washington have reached an understanding and Bangladesh has expressed its desire to work on them. Rocca also said the amount of economic assistance to Bangladesh is an important issue since the US as a strong ally wants to see Bangladesh stable. However, she could not provide any figures to re-confirm the new amount of $109 million of aid assistance per year that the foreign secretary gave on Tuesday. Rocca also reiterated her observation that foreign investment would be encouraged by the quick implementation of an effective and independent anti-corruption commission. She also said greater foreign investment will be invited if transparency and sanctity of contracts were ensured. She also said in her discussion with main opposition Awami League she had encouraged them to attend parliament and shed violence and hartals as methods of political dissent. On the second day of her fourth visit to Bangladesh, Rocca met Prime Minister Khaleda Zia, Leader of the Opposition Sheikh Hasina, Foreign Minister M Morshed Khan and Adviser to foreign ministry Reaz Rahman, among other government officials. Rocca is scheduled to leave Dhaka this morning.